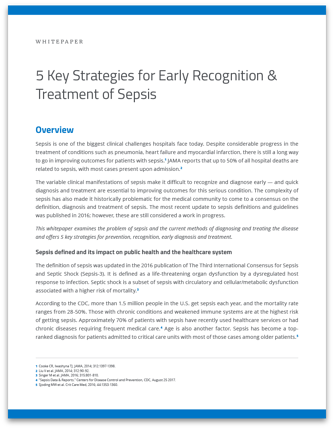 5 Key Strategies for Early Recognition & Treatment of Sepsis examines the problem of sepsis and the current methods of diagnosing and treating the disease and offers 5 key strategies for prevention, recognition, early diagnosis and treatment. 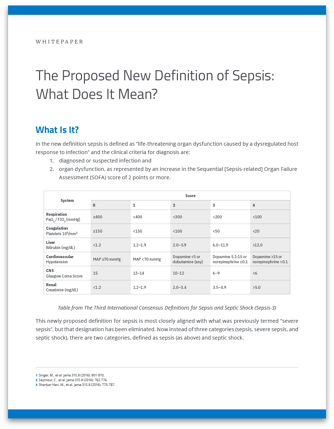 The Proposed New Definition of Sepsis: What Does It Mean? The Proposed New Definition of Sepsis: What Does It Mean? examines the proposal of a new definition of sepsis: Sepsis-3. It further discusses the new definition’s advantages, disadvantages, and effects on the healthcare industry as a whole. 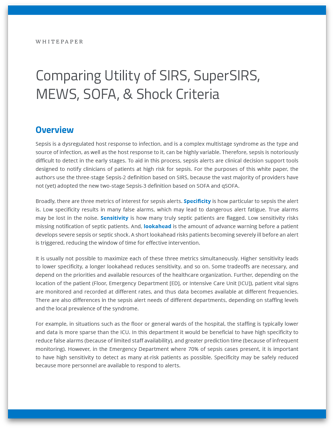 Comparing Utility of SIRS, SuperSIRS, MEWS, SOFA, & Shock Criteria explores the current methods of diagnosing and identifying sepsis in patients and investigates the pros and cons of each method.